Detroit’s pantheon of architects looms nearly as large as the buildings they designed: Albert Kahn, Wirt Rowland, Louis Kamper, C. Howard Crane. However, one who’s often overlooked is Charles Nathaniel Agree (pronounced A-gree). Mention some of his buildings, though, and there’s a nod of recognition: The Whittier Apartment Hotel, the Grande Ballroom, the Belcrest Apartments, the Vanity Ballroom, the Holden Reptile Building at the Detroit Zoo, and the Art Deco downtown hot spot, Cliff Bell’s. Agree’s résumé also covers a passel of movie theaters, including the Hollywood, Beverly, Westown, Royal, Harper, Palmer Park, Dearborn, and Woods. Then there are his designs of retail buildings that once were neighborhood staples: Cunningham’s drugstores, with their trademark exterior green-enameled steel panels; Winkelman’s women’s shops; and Federal department stores. Later in his career, Agree designed sprawling shopping centers such as Oakland Mall in Madison Heights, Eastgate Center in Roseville; Pontiac Mall (renamed Summit Place) in Waterford, and the Lincoln Park Shopping Center. Add several apartment buildings and a half-dozen residences into the mix, and Agree’s output adds up to an impressive portfolio. A bus tour this month sponsored by Preservation Detroit (formerly Preservation Wayne) will focus on about a dozen structures, says tour leader and organizer Gregory Piazza. The tour will end with lunch at Cliff Bell’s on Park Avenue. Although Albert Kahn designed the building that’s home to Cliff Bell’s, it was Agree who designed the former supper club’s entrance and interior in 1935. “It’s one of the few practically untouched interiors that he did,” Piazza says. The club, with its signature tables for two along the bar, is rich in mahogany and brass accents. Among the many framed photos on the wall is one of owner Cliff Bell with Agree. After being shuttered for 20 years, the spot was renovated and reopened in 2005. Other Agree buildings, such as the Belcrest and Whittier, are similarly occupied, but a good number are either decaying or have been lost to the wrecker’s ball. The Grande Ballroom, on Grand River and Beverly, is in dismal shape. It was famous as a magnet for Big Band fans and performers in the 1940s, then got a second wind beginning in 1966 as haven for local and national rock acts. The MC5 was the unofficial house band, but top acts like Led Zeppelin and Cream played there, too. The Vanity Ballroom, an Art Deco/Aztec masterpiece at Newport and East Jefferson, also sits neglected. The beautiful Hollywood Theatre on Fort Street, which, at the time of its construction in 1927 was the city’s largest neighborhood theater, was razed in the ’60s. Similarly, the Beverly, Palmer Park, and Westown theaters are also just memories. Other Agree theaters, such as the Harper Theatre, found new life. Now Harpo’s Concert Theatre, it’s a draw for the heavy-metal crowd, while the Krim in Highland Park has been repurposed as a church. 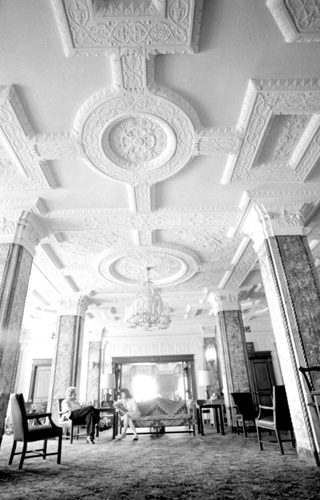 The lobby of the Whittier Apartment Hotel (top), on Burns near East Jefferson, in a 1980 photograph. The Beaux Arts ceiling is a distinguishing feature of the opulent structure. The Whittier, which opened in 1926, was Agree’s first major commission. Agree’s architectural breadth may explain why he stayed working for so long. “He’s kind of hard to peg, because he went from very formal styles early in his career with smaller apartment buildings, to the classically restrained style of the Whittier, to all of his beautiful Art Deco buildings, then to the more modern shopping centers of the 1960s,” Piazza says. Agree also delved into other styles, including Art Moderne (typified by the clean, curving lines of the 1939 Harper Theatre); neo-Romanesque (the Belcrest); and Moorish and Aztec influences, evident in the Grande and Vanity ballrooms. Agree’s first major commission was the Whittier Apartment Hotel on Burns near East Jefferson. The Italian Renaissance Revival-style edifice opened in 1926 and, through the years, hosted everyone from Horace Dodge Jr. and Eleanor Roosevelt to Frank Sinatra and The Beatles. Born in Stamford, Conn., in 1897, Agree arrived with his family in Detroit when he was 12. He attended Cass Tech High School and the Detroit Institute of Technology. In 1919, he launched his firm in downtown Detroit’s Book Tower, which Piazza says once housed many architects and developers. The firm relocated to McNichols, on the northwest side, then to Northwestern Highway in Farmington Hills. Marjorie Stein, one of Agree’s two children (his son, A. Arnold, who also worked as an architect with the firm, is deceased), says the family home was on Wildemere, but Agree and his wife, Sara, later lived in an apartment on Whitmore, in Detroit’s Palmer Park neighborhood, and finally in the North Park Towers in Southfield. Although Agree built several residences, Stein says her father didn’t design any of his own dwellings. Sartorially, Agree was as elegant as his buildings, Stein says. “He was a very snappy dresser, very fashionable,” the Bloomfield Hills resident says. Her nephew, Carter Agree, of Canton, has similar memories. “My grandfather was very dapper; he always fit the part of the sharp-dressing architect,” he says. Perhaps part of the reason Agree, who died in 1982, didn’t achieve the same fame as his colleagues is that he shunned the limelight. Piazza, a former resident of the Palmer Park area, interviewed Agree in 1980 while the former was working on plans to designate the area a historic district. Agree had designed the nearby Palmer Park and Krim Theatres, in addition to apartment buildings in neighboring Highland Park. 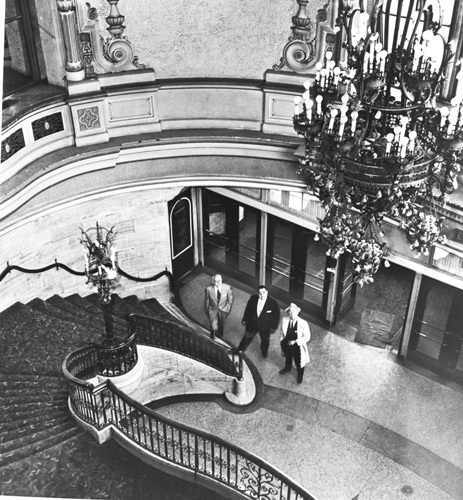 An undated photo of the lobby of the Hollywood Theatre on Fort Street and Ferdinand in Southwest Detroit, shot from the top of the winding stairway. The Hollywood’s lobby was 60 feet high. From left are Hollywood manager Clarence Apgar, Fred Sourbeck, of the Cohen theater circuit, and Bobby Clarke, who played the Hollywood’s Barton organ. Designed in the Spanish Renaissance style, the lavish Hollywood cost almost $2 million to build in 1927. 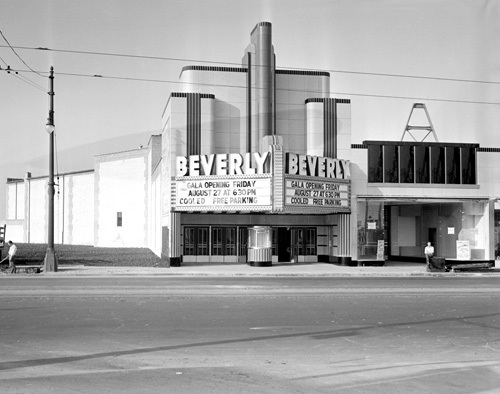 The theater also hosted live shows; Jack Benny, Bob Hope, and Sophie Tucker all appeared on its stage. The Hollywood closed in 1958 and was razed in 1963. “He was very humble, almost shy; he didn’t want a lot of publicity,” Piazza says. “In the intervening 30 years, I had a chance to look at his work, and he really had a lot to crow about, but he didn’t do that,” he adds. His grandson says Agree was more concerned with other matters. “He was involved a lot with the community — Sinai Hospital, Shaarey Zedek [where the architect worshipped], and other places. He was really community-minded,” Carter Agree says. “My father was also very charitable, which not everyone knew about,” Stein says. Today, the architect’s name is associated with another venue, albeit some distance from Detroit. The Charles N. Agree Outpost Camp north of Wawa, Ontario, is part of the Tamarack Camps for Jewish youth. The land was donated by the Agree family in 1965. Three of Agree’s buildings are on the National Register of Historic Places: The Belcrest, Whittier, and Vanity. The last location, where Duke Ellington, Woody Herman, and Benny Goodman would swing, and where as many as 1,000 couples crowded onto the maple spring dance floor, has been silent for decades, a melancholy fact Piazza says is especially poignant. The May 19 tour will leave from Cliff Bell’s, 2030 Park Ave., downtown Detroit, at 10 a.m., and will end at the same spot for lunch. Tickets, which include lunch, are $50 and must be bought in advance; or 313-577-7674 or 313-577-3559; preservationdetroit.org.